There is a presentation I do on social media with an introduction that tries to put current social media trends into context, arguing that a lot of the things happening now are not new. However, this is not all new. Six Degrees was arguably the first social network (founded in 1997), but the principles of UGC go back a lot further. 'Letters to the Editor' is a well established form of UGC, whilst America's Funniest Home Videos / You've Been Framed are long established parts of the programming schedules. Tony Hart though was arguably the first to bring UGC to a mass audience on TV. Tony Hart presented a series of manic childrens art shows (Take Hart, Hartbeat etc) on the BBC from the 1960's through to the late 1990's and he aimed to make art accessible and fun for children. 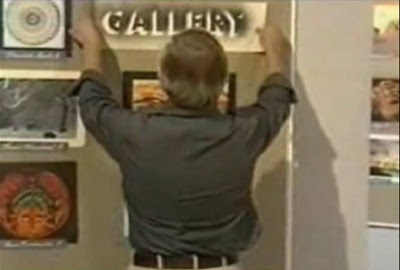 One of the consistent pillars across all of his programmes was 'The Gallery' where viewers could send their ('user generated') pictures and paintings into the show, with the best entries showcased on TV in The Gallery. I, like many others, grew up watching Tony Hart's shows and images of the Gallery have long featured in my 'history of' / 'what is' User Generated Content presentations - this ability to create something yourself and then have a platform (The Gallery) to showcase it to a large audience essentially being the key principle behind social media today. It was therefore sad to hear that Tony Hart has passed away. I will leave it to other sites to write full obituaries, but in my eyes Tony Hart is a 'founding father' of UGC and I wanted to recognise his role in this by saying goodbye here.